JEE Main Admit Card 2019 HIGHLIGHTS: The National Testing Agency (NTA) has released the admit cards for the JEE Mains 2019. The candidates can download the JEE Main 2019 admit cards through the official website, nta.ac.in. The first phase examination will be conducted from January 6 to 20, 2019 and the second phase in April. This time, students can either sit for both JEE Main January or April exam. The admit card contains important details like exam centre, time, name, date of birth, gender, state code of eligibility and category. In case of any discrepancy, communicate NTA immediately for necessary action. Students need reach the examination venue at least two-and-a-half hours before the start of the examination. JEE Main January exam results will be available by month-end. The admit card for the Joint Entrance (JEE Main) exams will be released after 6 pm. As per the official, the website of the National Testing Agency (nta.ac.in) has faced some technical glitches and it will take some time to resolve. The NTA is trying to release the admit card by tonight. Due to some technical problem, there is a short delay in hosting the admit card link. The admit card will be live at the official website, nta.ac.in at 3:30 pm, said an official. The students can download the admit card through the official website, nta.ac.in. As the examination will begin from January 6, the admit card will be available at the official website, nta.ac.in, till January 5, 2018. The examination is scheduled to be conducted from January 6 to 20, 2019. Following the trend, the website may hang due to the load of the users, minutes after the release of admit card. If the students may face this kind of trouble, they have to wait till the website started running properly. The admit card will be released shortly at the official website, nta.ac.in. 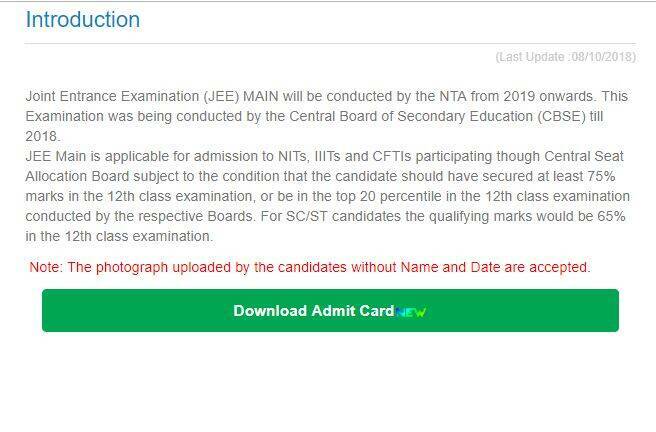 When the 'JEE Main' tab on the official website, nta.ac.in to be tuned to 'JEE Main 2019 New', that means the admit card link is active. Just keep a tab on the official website, the admit card will be released shortly on the official website. The admit card of the JEE Main examinations will be released anytime after 2 pm. The students who will appear in the examinations can download the admit card through the official website, nta.ac.in. The examination will be conducted from January 6 to 20, 2019, and the second exam from April 6 to 20, 2019. 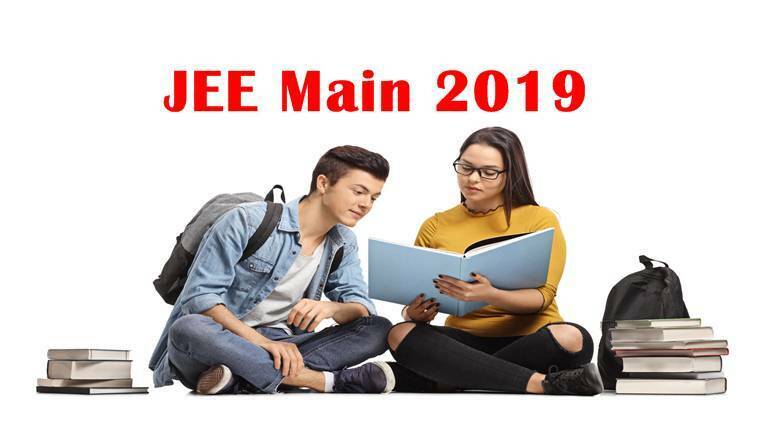 While the JEE Main 2019 will be conducted twice in a year, the number of attempts for admission in a particular academic session will be treated as one. Candidates can put forth their best score for admission to an institute, even if they have appeared multiple times. Also, since there is only one attempt for JEE Advanced – entrance to IITs – candidates can only appear once a year in the JEE Advance and that would be considered final. Each candidate is allowed to appear for three consecutive years for JEE Main exam. When students practice similar questions too often, they develop a tendency to identify and solve them as per their self-interpretation. MCQ questions are often framed in a deceptive manner. Ensure that you read and understand the questions properly before attempting them. Also, avoid silly mistakes. After performing well in mock drills and practice papers, students, to a certain degree, become overconfident. This results in careless mistakes and wasting a substantial amount of time in rechecking calculations. This possibly is the biggest blunder that students make during the preparation. Giving room to doubts directly increases hesitation and leads to lack of confidence. Trust yourself and your abilities. Develop a positive mind-set. To do so, implement a goal-oriented strategy. For students that are not able to deal with this problem must set long goals initially. Moving forward, successively decrease the time period between. However, this activity should not be done during the last 15 days before the examination. Students often make their preparations synonymous to studying with an exhaustive combination of reference books and study material. More than 70 per cent of the questions are either from NCERT or are an extended version of its learnings. Students should primarily stick with NCERT course books and head towards reference books only upon its completion. It has been observed that students prefer method-based approach rather than applying a conceptual understanding over the questions. Initially, this approach might serve the purpose, but it can become quite detrimental for students because many a times, despite being framed on similar lines, a slightly off-patterned question becomes difficult to understand. Thus, it is always advised to apply concepts in each and every question that you solve. The JEE Main exams is scheduled to be conducted from January 6 to 20, 2019. From the upcoming academic session, the examinations will be held twice a year. After the examinations on January, the second examinations will be conducted from April 6 to 20, 2019. Visit the official website, nta.ac.in. Click on 'JEE Main 2019'. Click on download admit card link. In the new window, log in with your user id and password, or registration/ roll number. Admit card will be appeared on the screen. Download it, and take a print out for further reference. JEE Main Admit Card 2019: When can students download admit card? As per the official, the admit card of the JEE Main exams will be available online after 2 pm. The candidates can download the admit card through the official website, nta.ac.in. The examination will be conducted from January 6 to 20, 2019. JEE Main admit card 2019: NTA will release the admit card of the Joint Entrance Examination (JEE) on the official website today at jeemain.nic.in. To qualify for appearing in the exam, students need to have at least 75 per cent marks or be in top 20 percentile in Class 12 examination. For SC/ST students, the qualifying marks would be 65 per cent in the class 12 examination.